Why take 4 different supplements when this 4-in-1 powerhouse has everything needed to help conquer your war against excess weight? 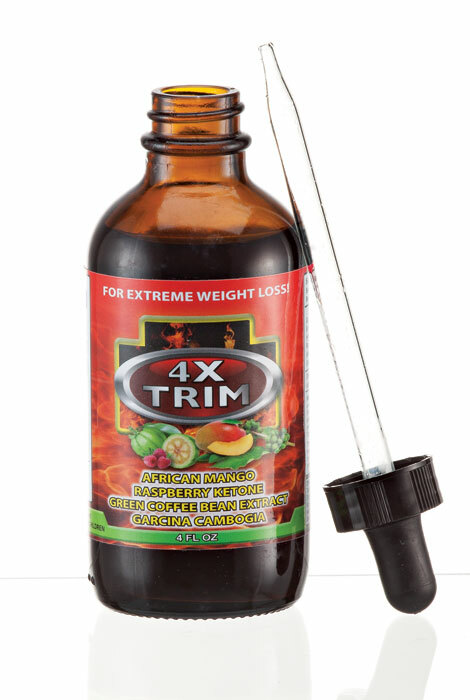 4X Trim weight loss extract offers the health benefits of African mango (helping reduce body fat), raspberry ketone (helping convert fat cells to energy), garcinia cambogia (helping curb appetite and block absorption of fat) and green coffee bean extract (helping burn fat). Simply place this weight loss extract under your tongue before and after meals, allowing 30-60 seconds for absorption, then swallow. 4 fl. oz. ; 60 doses. Shake well before use. Take one dropper twice daily, prior to meals. Dropper should appear half full. Drop liquid under tongue and allow 30-60 seconds for absorption, then swallow. I have tried a lot of the weight lose products on the market, today and this one really provided results! If one uses it both before and after meals, then the weight comes off quit fast! East to take because no water is needed! I take it with me when I head out for the day or evening. Worth a try, for sure! I won't spend money on anything else. I Love it!! Best weight loss product ever!! Had success with 3 of the ingredients individually would like to try them all together. The reviews were positive so I'm going to give it a try. Sounds. Easy to use, and got a 5 * rating. The $39.00 product (similar) worked. Thought I'd try this one and compare. I want to help the food cravings. I am in need of something to help with cravings and shaking when hungry -- this received great reviews so am anxious to start. I want to try and see how it will work for me to lose weight that is unwanted. TRY EVERYTHING WANT TO SEE IF THIS WORKS. I haven't used it yet. I plan on trying it next week.